flowers for flower lovers. 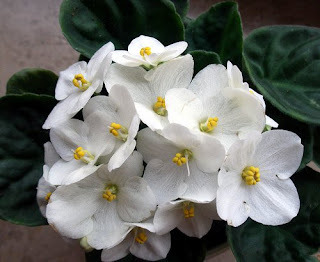 : White African Violet Grow Healthy African Violets. 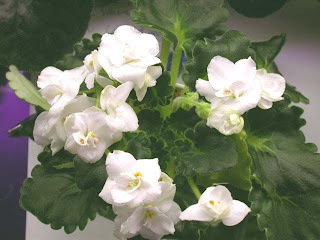 White African Violet Grow Healthy African Violets. African violets have the reputation of being difficult as a house plant but new varieties are much easier to grow. While they don’t thrive on neglect as some house plants do, with a little attention to their needs African violets will reward you with beautiful blooms in a wide range of colours. Most older books call for African violets to be watered by pouring water in a saucer and setting the pot in it so it draws water up. With modern, well draining potting soils you can just as safely water from the top. Just make sure to keep water off the leaves or it will spot them. Don’t water on a schedule, water when the pot feels dry to the touch. Use distilled water or rainwater for best results. If you use chlorinated water let it sit a day or so for the chlorine to dissipate. Use mildly warm water to avoid shocking the plant roots. Both hard and softened water may cause a build up of mineral salts in the soil. If you use either, watch for yellow-white crusts on the top of the soil or sides of the pot. You should re-pot the plant in new soil if this happens. 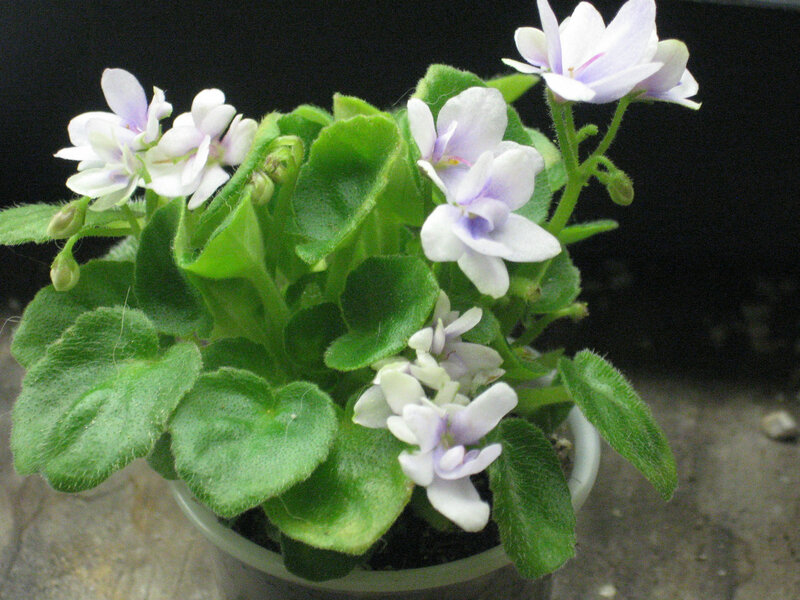 African violets are jungle plants and appreciate high humidity, which most homes don’t have, especially in the winter. If your home doesn’t have a humidifier you can sit your African violet pots on a tray filled with marbles or decorative stones and some water. The stones or marbles should hold the pot bottom out of the water, so the pot isn’t continually soggy, which would kill the plant. Do not mist your African violets, water will spot the leaves. African violets flower in repeated cycles if they have all their needs met. That is they will flower for a month to 6 weeks and then rest before repeating bloom. Some varieties are more free- blooming than others. Remove dead flowers to make the plant look nicer and encourage more blooming. African violets come in many colors from white to pink to deep purple. Some are bi-color. 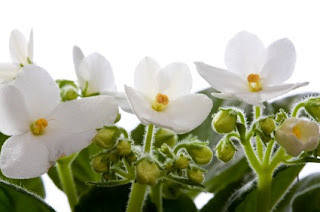 There are double flowered African violets, fringed and star shaped blooms and a whole range of leaf shapes and sizes. African violet growers often enter their plant pets in shows and get involved in developing new varieties. There are special mixes sold for potting African violets but any good soil-less potting mix will work. Soil-less mixes are composed of peat, vermiculite and shredded bark. They are light weight and drain well. Do not use garden soil for African violets or buy cheap, heavy potting soil. The pot you use for your African violet can be clay, ceramic or plastic but it must have good drainage. Don’t use too large of a pot as large pots cause watering problems. Small plants will grow well in 4-5 inch pots, as the plant increases in size it can be transplanted into 6-8 inch pots. In Michigan African violets should be fertilized from March to September. If the potting soil you used had fertilizer mixed into it, (check the label), you will not need fertilizer for several months. Use a special African violet fertilizer or a house plant fertilizer and carefully follow directions. Too much fertilizer will cause more problems than too little. If the plant has dark green healthy looking leaves and blooms regularly it is getting enough fertilizer. Grow Healthy African Violets. Keep the temperature in your home between 65 to 85 degrees. The east window is the best lighting for African Violets, they need lots of light but not direct sunlight. Do not over water! Always water from the bottom of the plant. If the plant is dry on the surface then water. I have a device that checks the moisture of the soil, I would suggest you get one of these. They can be purchased at a hardware store. Let water stand overnight to allow the chlorine to evaporate. Fertilize with African violet fertilizer. To keep your African Violets healthy, they need to be re potted at the least on a year. This gives the plants new nutrients through having fresh soil, and helps get rid of fertilizer salts that may have built up. If one of your African Violets has developed a neck, a bare place where the leaves have been taken off, you should re pot it as soon as possible so the neck is covered with soil and can grow new roots. Labels: White African Violet Grow Healthy African Violets.